Mt. 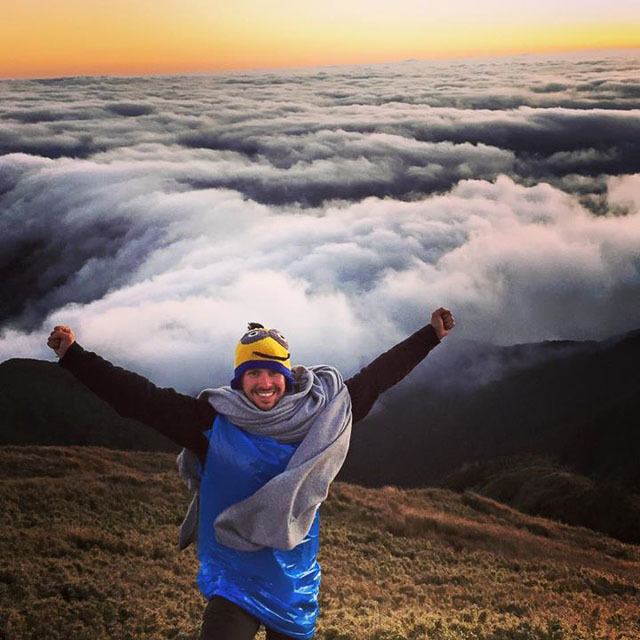 Pulag Trekking Guide for The Philippines. Frozen air crept through the night as I snuggled deeper into the blanket wrapped around me like a shroud. I was the first up, the camp only just beginning to stir. Mt. 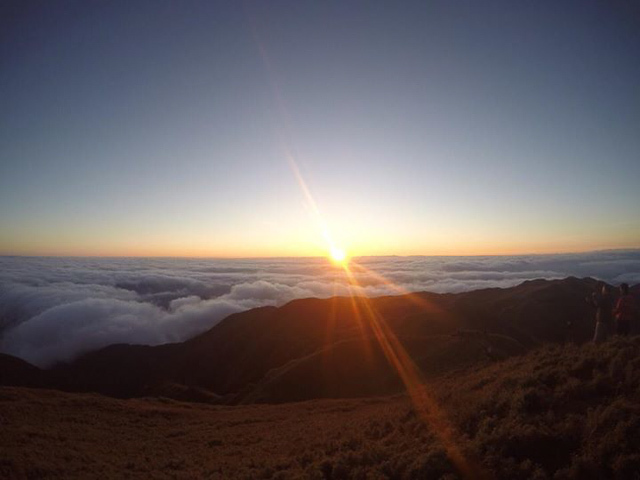 Pulag in The Philippines was a great unknown to me… It had been an uncomfortable night, I had barely slept as the temperature had plummeted and my feet had turned to blocks of ice. Would it be worth it? I had no idea what to expect. I stood, transfixed, the stars above me twinkling brightly in the darkness. I took another minute to soak in the skies above me and then fumbled for my head-torch. I was joined by an eager Pinoy backpacker in a bright blue down jacket and an English couple backpacking around Asia. Together, we set off into the darkness in search of Mt. Pulag. Soaking grass pulled at my trousers as I followed the rough path out of the camp and into the hills. I could see the outline of Mt. Pulag ahead, blocking out the sky, rising up out of the darkness like some kind of forgotten monument. I could barely see three meters in any direction but my Filipino friend, Jose, urged me onwards and together we plunged on. As a group, we tackled the path, forcing our way through tangles of grass obscuring our route. Slowly but surely, we began to climb. 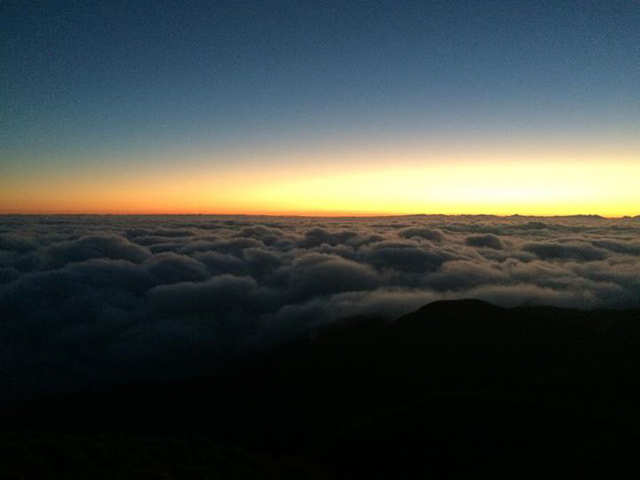 The top of Mount Pulag beckoning to us through the pre-dawn chill. We arrived almost without warning, the path simply ending and spitting us out atop the summit of Luzon’s highest mountain. We turned and spotted a trail of faint glows, head torches in the mist, stretching across the grasslands and back towards the campsite. Unknown shapes danced in the darkness as the sun slowly began to rise. I strained my eyes, I could just about make out what almost looked like an endless ocean of clouds. Almost on cue the sun obliged us and began to rise in the distance. Slowly, surely, the scene below me was revealed. An endless plain of fluffy white clouds stretching as far as the eye could see. Psychedelic patterns weaving and turning in the clouds, the sun coloring everything shades of orange, pink and gold. A Pinoy backpacker sat next to me, beaming happily. “This is amazing” they whispered conspiratorially. I smiled, chatting to my new friend for a while about their favourite places to go backpacking in The Philippines. I myself have tackled steaming jungles and endless deserts, perilous peaks and mysterious caves; no challenge was too great in my quest to witness the perfect sunrise. I made a mental note to thank the many folks online who had reached out and advised me to visit this truly special place. The view from Mt. Pulag on that frozen morning may just be the most incredible thing I have ever seen. Clouds raced towards us and disappeared into a nearby valley, tumbling onwards like a river. I sat, content yet cold, soaking in the first rays of warmth from the sun. I was jealous of the other travelers; they all had good gear and looked relatively warm. Slowly, reluctantly, we began to leave the peak in twos and threes. Back at the camp, I joined Jose and some of his friends for a tasty breakfast of tiny sausages, rice and strong black coffee. I packed up my gear and prepared to leave. I paused, turning to look at Mount Pulag once more time. This was a truly special place. If the rest of the Philippines were anything like this, well, I doubted I would ever want to leave. The trek itself is not particularly hard. It is probably one of the easiest hikes I have done despite the fact that I didn’t have the right gear. Mt. Pulag is more of a big hill than a mountain and whilst I do advise bringing waterproofs and warm clothes you don’t need to spend a fortune on any specialist gear. Definitely take or rent a head-torch. Check out my backpacker packing list for more information on what you might want to consider taking. There are numerous tour agencies in town who are able to arrange your trek for you and although you could do the trek without a guide you are not technically allowed to. Getting to the start of the trek from Baguio takes a couple of hours and this is where going with a tour company becomes pretty handy; they will charter a jeepney to take you from Baguio to the mountain at stupid-o-clock in the morning. My trek was kindly sponsored by Travel Cafe and I can recommend them for making all of your Muont Pulag arrangements. They are certainly one of the better-value operators and are easily contactable by email or by simply going into their office in Baguio. For adventurers wishing to brave Mt. Pulag, Baguio is pretty much an essential stop as you have to start the trek so early in the morning. Baguio itself is not that exciting but most travellers end up spending at least one night here so it does make sense to plan ahead and sort your Baguio accommodation in advance. I didn’t bother to book Baguio accommodation in advance which proved to be a really bad move as a lot of places were already full. If money isn’t an option, I recommend checking into Newtown Plaza Hotel, I heard rave reviews from a group of Filipinos who were staying there. A more budget friendly accommodation choice is Dream Transient Rooms which is where I stayed. Rooms are clean, simple, well-located and cheap! There is a whole load of bars and restaurants to choose from in the town centre; keep an eye out for the American-themed diner if you want something a little bit different or stick to the plentiful and cheap local eateries. How long of a climb is this overall? 6 hours trekking time from where the trek starts all the way to the top – almost everyone breaks it in half and stays overnight (about 4 hours in) though. Bucket list! I simply must have a hike that takes me above the cloud-line. Wicked. Ive been meaning to read this and just never obtinaed a chance. Its an issue that Im very interested in, I just started reading and Im glad I did. Youre a excellent blogger, 1 of the finest that Ive seen. This weblog undoubtedly has some information on topic that I just wasnt aware of. Thanks for bringing this stuff to light. Thanks Krishna! There’s more to come so stay tuned! what about the milky way? can you see it?